Thanks and hope whoever using Gen8 + esxi combination find this useful. Cheers. Good that you are pleased with your set up. Everyone has their own way of doing it, I just couldn't stand having the odd 50MB drive there, kind of bugs me not getting rid of it. You need to add rmmod=ata_piix to the grub/syslinux config on the kernel line. That's why you're seeing the boot loader as a drive in DSM when using ESXI. I'm not sure why the people creating VDMK's aren't doing that step. This will also prevent DSM from writing over your bootloader disk when doing a fresh install, and formatting blank drives on initial installs. Is this step somewhere in any tutorial? At the moment I've got the boot disk mounted but, only a grub.cfg in there no syslinux to be found. And what do you mean with "on the kernel line"? This helped me for setup. 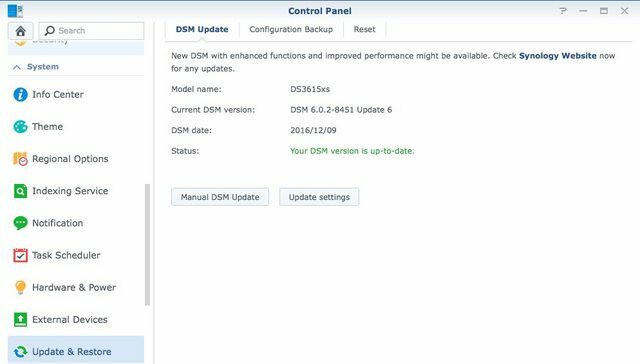 Is it safe to update to DSM 6.0.2-8451 Update 5? Update 5 has been running on my backup N54L and an ESXi install for almost a week. I updated from control panel without issue. Please tell us what you are doing. Are you installing on a new system or upgrading an existing system? What actions did you perform? At what step do you get the messages? Installed update 6 on a test VM machine without issues. Synology announced the DS3617xs. is it possible to update the loader ? Update? I haven't seen any features that would be exclusive to this new model. Just new hardware. This thread is going too long, is there a clear method of going from DSM 5.2-5967 to DSM 6.x? I am using a Intel CPU iTX board with 3x6TB WD Reds. Been running 5.2 for a few months stable. I had to import the original vm in VMware Workstation Pro (I had errors at import in esxi 6.5), and chage to hw version 10, export to new ovf; imported the new ovf in esxi, edited a few things, start once to retain the vmware boot option, changed the boot drive to non-persistent (it's hidden in xpeno now) and exported again to the ovf in the link for easy future use. I hope it will be useful to others to; if I messed up something let me know, for me and a few others this worked nice. On my gen8 microserver I don't have and can't add an usb3 controller; this could be a poor choice at vm guest os version, I put "other 3.x or later linux x64", did not tried any other way yet. The usb3 issue is not present on the atached hw 10 ovf(the one in the link), you can add usb3 controller in it; my xpeno install is on a vm with hw 13 and that is why I can't add an usb3 controller. I am trying to get it running on a dell optiplex 740 with 2x320GB HDD. The USB key is prepared and i get the installation screen, but the web assistant tells me "No harddisks found on ds3615xs". Has someone a solution to this? Does this mean you always get the same message with the same error sectors if you put different drives in your box? And does it say hd0 or md0. If it says md0, then you need to create the bootloader on another USB stick as yours is not working properly. Hey guys, I'm new to XPEnology and Synology in general. I got everything working 100% on my little Skylake system including all the updates, thank you developers! Was wondering how safe is it to roll with this custom boot-loader? Since the OS is stored on disk, is it just a matter of updating the boot-loader when the time comes? just a googleable note if somebody wants do a similar build as me. I did a successful bare-metal build using Jun's Mod V1.01 on the following hardware. I installed 6.02 successfully, the ensuing updates to 8451-update5 went smoothly. I am also successfully using tvheadend and emby with a PCTV 461e USB stick without problems. All C-States and P-states are enabled in the BIOS. is it possible for an experienced linux user to compile its own kernel for xpenology and is there some kind of documentation for that on how to do that? I am new to xpenology but I noticed some kernel settings which I would like to change (e.g. enabling intel_idle and others). Do you use the OnBoard NIC? I have an almost identic Board (E3C224D4i-14S) which also uses 2x Intel i210 NIC.